I have been loving my Lunt 50 so far. I have it piggy-backed on my Evo 8 so I can control/slew from a remote location in a dark space. However, I have been amazed at all the high-res surface shots that many of you have posted. So I may need to dig my personal money pit a little deeper and get a larger aperture and a quark. I first considered getting an off-axis filter for my Evo 8 but that only goes to 63 mm. Hardly much of an upgrade and many of you have previously posted that you need 100-120 mm to start to get some good detail. And the full aperture filters are way out of the price range, although that would be ideal. There are tons of refractors and mounts to choose from but I discovered the Celestron Nexstar 102 SLT and I am wondering how that would work? It has a motorized goto mount that I can remotely control so I like that. The focuser seems a bit cheap and not sure if it would support the weight of a quark so I would probably want to replace it. Although I can't tell if it is removable. The price is certainly right and my understanding is that you don't need a high-end refractor for just Ha so I am wondering if it is good enough optically. I like visual but I also like imaging with a ASI 178MM. The SLT mount is not a good idea for solar imaging, especially at high focal lengths (the regular Quark is also a 4.2x barlow) but is fine for visual. Is it possible you could buy a separate refractor and attach it to your Evolution mount? That would cost nothing and would be far superior at tracking objects. If you use your ASI-178MM with the Quark, you will have to bin 2x2 as 2.4 micron pixels are way too small for the Quark. Edited by overnight, 17 April 2019 - 10:36 AM. Yes, I was thinking about just using my Evo mount but I typically leave the SCT on it and it is all ready to go. I guess I am just lazy and didn't want to have to mount and remount it. I have been looking for another Evo mount but they don't come up for sale used very often. Yes, I figured I would need to bin 2x2. Would the SLT scope itself be a good option? It works, but you want to replace the focuser ASAP. It may or may not be as simple as taking off the old one and putting a new one, Celestron doesn't always use readily available flange sizes. Depends on your seeing conditions. 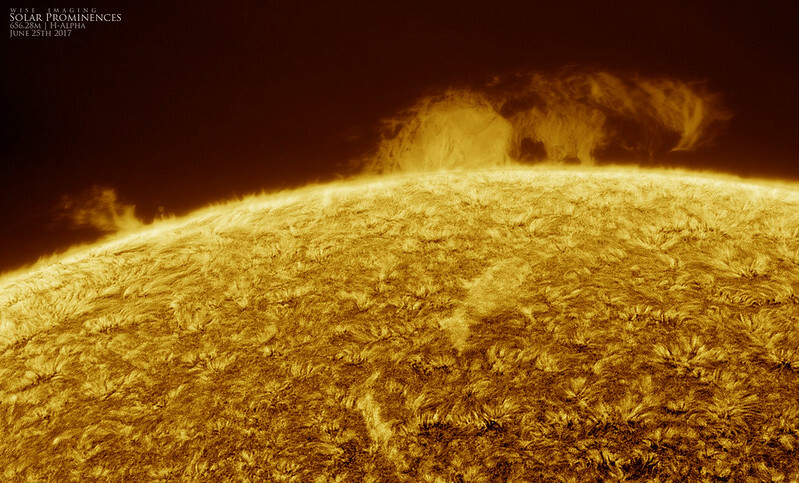 102~127mm aperture is an awesome aperture in general for most solar features. And with a Quark, it's affordable, and no front mounted ERF needed. A good focuser is however highly suggested (aftermarket, something linear bearing or similar in strength for imaging). These apertures will resolve most of the features you see images of quite well. Going larger requires significantly more cost, and demands much better seeing along with it. In general, I'd say get a 102mm F7~10 achromatic doublet. Get a 120~127mm F7~8 achromatic doublet if seeing is really great. I can highly recommend the Celestron Omni XLT 102mm F10 and Omni XLT 120mm F8 achromats (I suggest a GSO linear bearing crayford focuser upgrade with it). These scopes can be had inexpensively used (very cheap, like $150~200). The only issue with these size refractors, and larger, is that they are demanding on the mount. A humble little Alt-Az mount will simply not handle these. These scopes are long, heavy on one end, and generate significant moment arms. 60~90mm refractors are also fantastic, and can be a lot easier to mount. 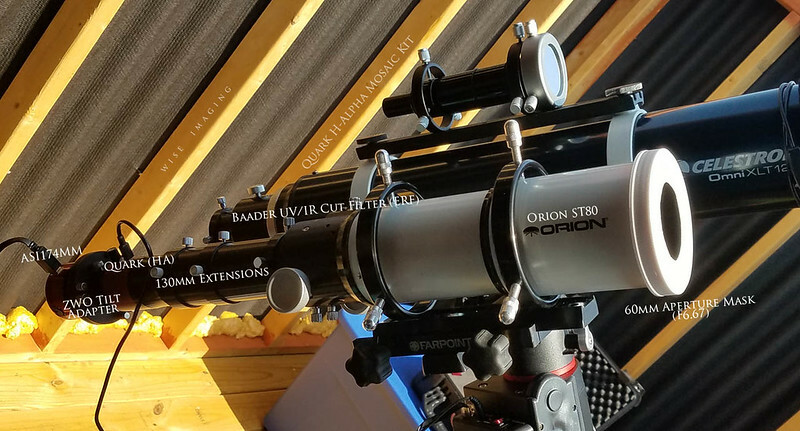 You could likely mount a 60~90mm short refractor on your Evo mount successfully. And this aperture still affords you quite a lot of resolution. That said, I would highly suggest you exhaust your efforts with your current Lunt 50mm. Practice getting the most from it. Here's some examples of what you could do with a Quark from 60mm to 120mm and what you might see at different scales. Again, you have to have excellent seeing to use larger apertures, so it's not always a good thing to go as large as you can early on. Edited by MalVeauX, 17 April 2019 - 05:11 PM. Thanks as usual for all your great advice. I am really impressed with your 60 and 80 mm shots. I have seen alot of your images and I always assumed they were with your "big guns". Maybe 102 mm is more than I need and I like the idea of smaller, lighter scope. I don't want to get an equatorial mount but Alt-Az mounts with tracking ability and the weight capacity are pretty scarce. I definitely have not outgrown the Lunt for sure and my images get better each time so I have a lot of use left in it. The Omni scopes don't look a whole lot different than the NexStar SLC. I knew you used an Omni and I was thinking the optics might be similar. Since it had the tracking mount, I figure it might work. But it did look a little wimpy and the stock focusers on both lines seem really awful. Thanks again. I think I will stick with the Lunt for now and maybe think about an 80-90 mm aperture later. I think you'll really like what you can get from 80~102mm apertures. 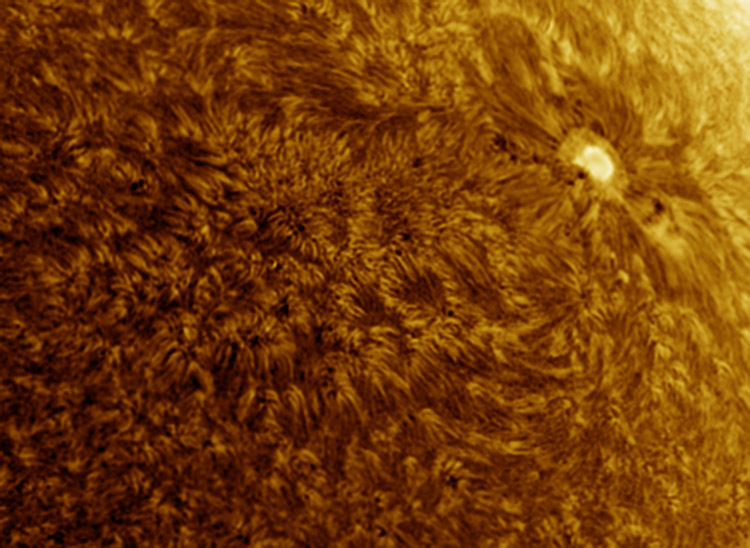 It's enough to explore detail that are small, individual fibrils & spicules, interesting prominences, and of course more intricate detail in sunspots and and active regions with plages, etc. Target something around F7 or longer. Longer is better (F10+), but it's also much harder to mount and handle. So you would likely find 80~90mm F6.7~F7.5 scopes fairly regularily and frankly all the common doublet achromatics are going to be totally fine for imaging like this, you don't have to worry about buying a cheap achromatic refractor and thinking of its optics. They are all good enough for this for the most part. So just get what's affordable and will fit and work with your setup. And you can likely get one for very cheap if you buy a used one. The only thing I highly suggest is to clean the optics and replace the focuser with something beefy because a Quark and extensions get heavy and will sag. Again, getting one used will save you probably half the admission price. All that is needed is an upgraded focuser, a 2" UV/IR block filter, and a Quark. Then just add a 0.5x focal reducer to bring the imaging scale back down. You can image at F15 no problem with your current IMX178 sensor, it will be over-sampled a little, but it will work. Again, in the mean time, practice with your Lunt 50mm. You can push the image scale up (with a 2x barlow, etc) and do higher magnification and larger scale imaging and look at details or do mosaics, etc. Edited by MalVeauX, 17 April 2019 - 03:47 PM. How deep can you dig your money pit?! 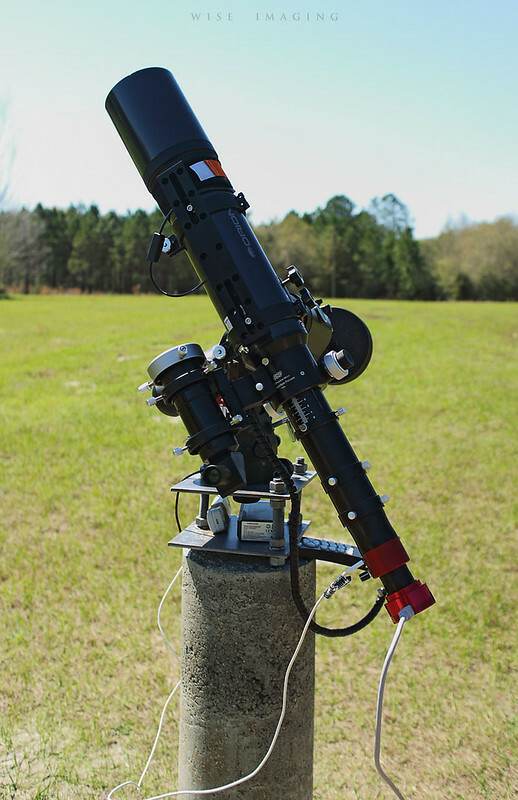 You can save the money on a refractor and put it towards a front mounted 8" DERF and use it with the Quark. Definitely more expensive but you can keep your existing mount, and quell your aperture fever for a long time. 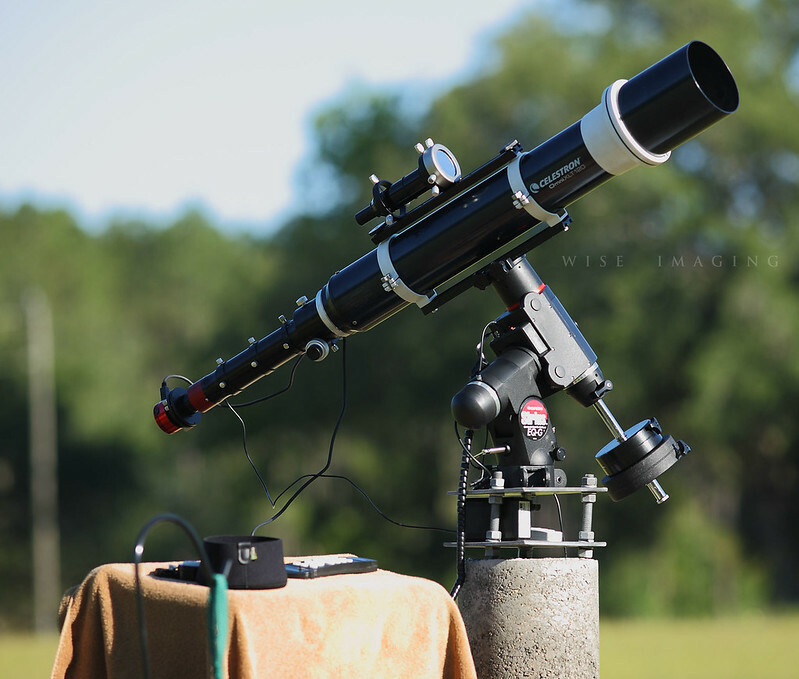 You won't have to switch telescope for day or night observing saving lots of time! Good luck, I'll say a prayer for you. All kidding aside, get the Quark. If you want to add a scope on to your EVO 8 then the Orion ST80 is light enough to work. You will need a better focuser, but it can be done. I think you could mount a light weight ~100mm scope on the mount alone. I've mounted my Explore Scientific ED102 on a Celestron SE 6-8 mount and actually imaged with it. It was staining a little but worked. I think the EVO mount is a bit stronger and taller and probably better adept at handling the load. All kidding aside, get the Quark. If you want to add a scope on to your EVO 8 then the Orion ST80 is light enough to work. You will need a better focuser, but it can be done. Yes, I think in the long run, a DERF is probably what I want. I really don't want to get another mount, etc. Valery's AIRES DERFs actually seem like the best value and price. Last post he made it was $1700 for a 8 inch. Add on 1200 for the Quark and the convenience of using my Evo and it really starts to look like the way to go. I do really like my Lunt 50 and I stilll have a lot to learn from it and to see thru it but this may be the way to go. Hmmm...I thought my mount was probably maxed out with my Evo 8 and the Lunt 50 piggybacked...you think I could push it further with an 80mm. Interesting...another option to ponder. Be very wary going for a large aperture. It will not be useful as often as you may want it to be. You really need to assess your local seeing to get an idea of what aperture and imaging scale your seeing can truly support before you go getting into a system like this. A good way to figure this out, is to get some photo grade ND3.8 solar film on whatever large aperture scope you want to use, and image with it, with appropriate pixel sampling. See if you can do that through the year before even considering going all the way. Also, know this: The 8" D-ERF plus filter holding cell + Quark will be nearly 10lbs total weight. Add that to your scope. Also, you will want to have a crayford focuser to avoid mirror shift when doing critical focusing on an SCT. So add that weight in too. You will find you're already past the limits of the Evo mount. My sincere advice is to stick with about a 80~102" aperture. You'll get more out of it more often in almost all situations. And keep your Lunt 50mm. Upgrade the focuser and add a 2nd etalon for a Double Stack system with it for full discs and you'll be set for the upcoming maximum. Edited by MalVeauX, 17 April 2019 - 07:13 PM. Of course I was not aware of any of that! Thanks, you may have saved me $3000! I think I will stick with what I have for now. You asked for suggestions and I figured I'd play along and give you one to consider. I've overloaded my SE mount many times with no ill effects. According to Celestron the SE mount is at its limit with the C8, but I've seen all kinds of things added and used for years. The EVO can handle 25 lbs. and the c8 is only 12, with all the other stuff you may be a pound or 2 over. Most of the time my seeing is bad to ok but sometimes you get that fleeting moment of excellent seeing. I wish I would have made up my mind earlier and not bought a 6" refractor and got my 8" DERF first. I think the biggest problem with any refractor without a front mounted DERF is the heat you are letting in and rejecting out of the tube. It is always turbulent. I find it's best when I'm observing over grass or other non heat reflecting turf. The best thing about these mounts is that they are portable. I've taken mine all over. It makes sense for me as it gives me more time with the scope. So if the seeing isn't ideal in one location you can always find somewhere that has good seeing. Usually surrounded by grass and some low trees. I guess the best advice is to take it slow. The Quark is a nice addition but I hate paying retail!. If you can get to NEAF or a similar astronomy show where Daystar is going to be, bring cash. I saved $300. I just saw a 102mm refractor used for $85. My last suggestion, sell everything, save yourself before you hit the bottom of your money pit! I consider this every other week or so! It's so true! You want to get what the sun would look like in a certain aperture, then look at the moon in a similar aperture at night. The moon starts really opening up in the 5" to 6" range, imo. Although for some people the 90mm is good enough. 10" is ideal although it would require probably an expensive solution if you go the D-ERF route. Some people in the solarchat group have been experimenting with solutions without using a D-ERF (remove the aluminum coating from the mirror), so that most of the light passes through. Maybe some sort of solution in addition to a small erf or filter could be used.. maybe. Anyway, just something theoretical in my head. It's very different using a 10" aperture during the day versus at night. The difference in seeing quality is profound. Some locations cannot support this aperture at all during the day. 5~6" aperture really is a great aperture for higher resolution imaging, and accessible to most people without crazy costs. Definitely agree! Unfortunately even these apertures can be difficult depending on seeing quality in any given location. Dealuminized mirrors allow you to image in white light without a front mounted D-ERF on a large mirror. However, it's not really much different than just using photograde solar film (ND3.8). The dealuminized mirror approach allows about 5% total transmission, so it's equivalent to a "herschel wedge" for mirrors. This does not allow enough transmission to image in narrowband such as HA, CaK, etc. Just white light (photosphere). 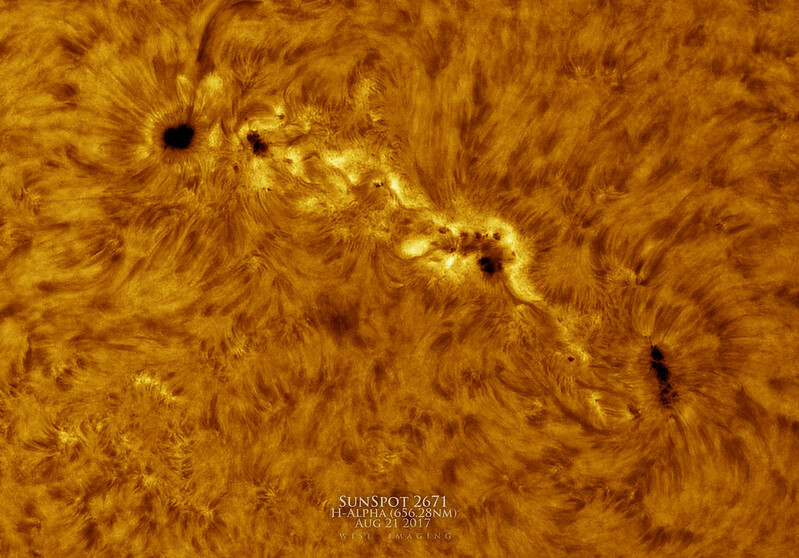 This is great if your interest is purely sunspots and convection cells and things like G-band wavelength though. But again, solar film is another easy way to accomplish this without having a day-time-only scope (the dealuminization obviously renders it useless at night). However, I have been amazed at all the high-res surface shots that many of you have posted. So I may need to dig my personal money pit a little deeper and get a larger aperture and a quark. As Marty and others have noted, the best solution for solar observing aperture is the one you can use most of the time, not the exceptions of "once in a blue moon" daytime seeing. Then again, larger apertures can always be stopped down. Also be advised that a lot of the images you see posted are highly processed, and the Quark generally will not show the level of detail shown in many of these images. If you want to actually see this kind of detail, you will need both larger aperture and double stacking etalons of much better quality. Additionally, I wouldn't jump into digital imaging too intently before you have cut your teeth on actual solar observing. As opposed to nighttime imaging, which is needed to make any faint green-grey blurry blotch of light look interesting, solar observing with the Mark 1 eyeball is quite adept at showing the features as distinctly as possible. But just as with planetary viewing, it takes some practice and experience - which if you jump too quickly into imaging you might never master. I've done my share of imaging, and I've spent an entire day obsessively capturing and processing images just so I could post them here or on Spaceweather. But honestly - I wasted a lot of time that I could have been actually observing the Sun. So I've cut back in the imaging area, and generally now find solar observing much more relaxing. 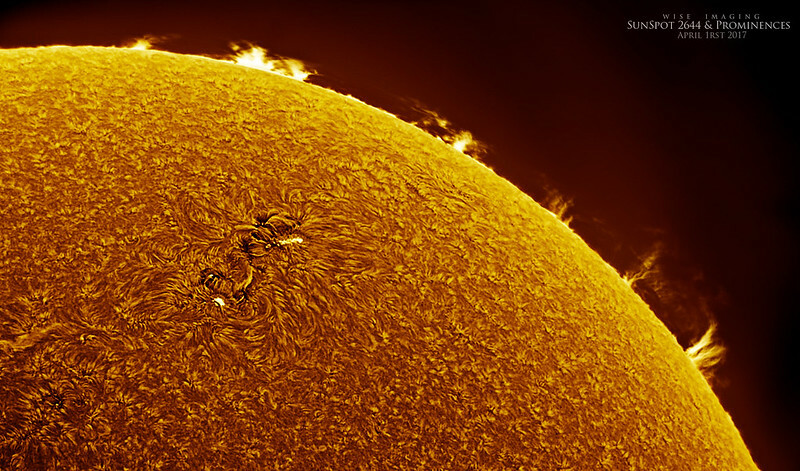 Try drawing a prominence or two at medium to high power to see what is really happening on the chromosphere. Get a good book on solar phenomena and the underlying physics and actually learn about the stuff you want to take pictures of. Once you've done that, then you'll appreciate imaging all the more. When things get cooking in a couple of years, I promise actually observing an explosive flare evolve or an eruptive prominence will beat the heck out of fiddling with cameras, adapters, exposure settings, software glitches, or watching on a laptop screen. I know, because I've done it - "oh look, a flare, I'd better get my camera set up so I can get some good pics..." Then your focus shifts to the equipment, focusing, trying to see the screen better, adjusting this and that. It's kind of the same thing as with total solar eclipses - these events can be short-lived and you can generally experience and absorb them, or you can almost miss them while trying to photograph 'em. I guess I'm saying try to balance observing and imaging. Edited by BYoesle, Yesterday, 05:01 PM. Yes, your comments make alot of sense I respect your opinion greatly as I have read many/all of your recent posts. I do like simply observing but I am also into EAA for nighttime stuff but also of the sun. It is amazing what you can see live with SharpCap and I have a pretty cool little "control room/dark room" setup with a big screen a short distance from my scope/camera so alot of my observing is done that way. However, it is hard to resist capturing a few videos and stacking them. I do very minimal processing - less than 5 minutes and I have gotten some pretty good images, but, of course, nothing like the great ones often seen in this forum. One reason (besides not having the patience to collect data for 12+ hours) why I could never do AP is that I really dislike image processing. As far as knowing how well your sensor and optics will play together, you can use Stellarium and set up the ocular plugin. It does a pretty good job of replicating field of view. As far as image brightness, contrast, and details however, you'll need to do this with a real-life test as stated with regard to the moon. The huge caveat here is that, while the moon does look amazing with 152mm and larger apertures, you're going to have a hard time finding daytime seeing conditions to allow for the larger apertures. Maybe this is simple denial due to aperture fever and me being satisfied with my LS50, but seeing conditions while the lithosphere isn't impeding the view are often times substandard for my little scope and are often punctuated by clouds and transparency problems. Sure, I'd love a 152mm device, but I don't think that I'd get to enjoy it as often as I would hope. But that said, I'm fairly certain that once the sun wakes up, we'll all have decent views with our scopes. As Bob said, a lot of this comes down to image processing. While I would certainly love to be able to produce the same quality images that some folks have presented, I know two facts that cause such an endeavor to be a negative. First, you set expectations to friends and family that they will see something similar when they look through the scope and perform a visual observation. This is somewhat unfortunate because visual observation is more exciting in a lot of ways because the human eye adapts to the huge dynamic range presented by the eyepiece and allows you to see proms and surface detail simultaneously even with a single-stacked device. Also, visual is a realtime thing, and it lends something to the experience. When people go into that with expectations set by amazing images that you have posted, there could be significant disappointment. Second, despite suffering in the dynamic range department, the camera is better than the eyeball in picking out detail. As an imager, you might be focused on trying to accentuate these details in your images without being mindful as to what is and is not visible through an eyepiece. When you do the visual observation, especially on the heels of doing your homework as Bob has pointed out, you start looking for certain phenomena and learn what they look like visually. You can this call this out when doing outreach and those looking through your scope will get a lot more out of it. For example, do you just tell people "hey, those are proms", or do you tell them about the different kinds of proms, specifically the difference between proms that are persistent and quiescent (arches, hedgerows, flame, cone) versus the shorter-lived active proms associated with flaring activity (loops, eruptions, surges)? Finally, learning to get the most of out a smaller scope will make you a better imager when you move on to larger scopes. The biggest question you should ask yourself before moving on to a larger scope is... are you truly diffraction limited? If you aren't, or don't know how to make that determination, then your wallet might benefit from some book-pounding and eye-to-glass time. Edited by jwestervelt, Yesterday, 03:53 PM.